Greetings, kind folk. Hopefully you’ve made your ESK lists and checked the twice. You’ve packed some clothing and acquired a good pair of boots. Now what? Water purification items and food. In order to survive you will need a minimum of one gallon of water a day person. You cannot carry enough water on your person to meet this need. I use a combination of boiling, purification tablets, and filtration to ensure safe consumption. Tis better to over kill than suffer the consequences. Food will be your second need. Let’s say two to five thousand calories a day, depending on activities. Dried foods are light and compact but require water for re-hydration. Canned foods are bulkier and more weighty. I suggest you split between the two. 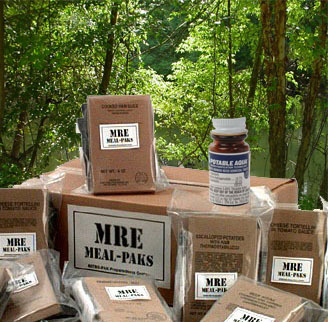 Military MREs are good, containing 2,000 calories each but can be hard on your digestive system. Hopefully you can forage for wild foods to supplement your stash. This entry was posted in Country, Emergency, God, Louisiana, Nature, Patriotism, Survival, Survivalist and tagged Country, Emergency Survival, Louisiana, Nature, Survival, Survivalist. Bookmark the permalink. Survival Tip of the Day: What’s the Buzz?